From April 13, 2018 to April 15th, the fifth module course of The PKU-KWM Global Legal and Business Executive Program was completed successfully. The excellent teaching of many famous teachers let the students think in the theoretical study and improve in the actual combat innovation. After the practice of theoretical learning and related practice of national governance and globalization, economic theory and business practice, contemporary political and international vision and the development of social innovation, in the fifth module course, we have ushered in the research of cultural and social governance issues. The three-day course includes case studies of social governance, business ethics and cultural ethics, as well as cultural creation competitions. To understand the great truth, we must study history first. The first day of the course, Professor Zhou Jianbo, from the school of economics of Peking University, shared the cultural and ethical implications of Chinese traditional business spirit and explored the influence of religion on China's economy in history. Wang Junfeng, President of the Global Management Committee of KWM law firm and President of the National Association of lawyers of China, shared the understanding of "the legalization of the living world of Chinese people". The 20th Century is a history of great changes in the heart of the Chinese nation. This history is associated with the legal rules or the reconstruction of the new legal system, and is intertwined with the conflict between the traditional and the modern. From a macro point of view, the present law is associated with fairness and justice, and is related to the social and economic order. "The legalization of life" shows social justice and care for the people's livelihood from the point of view of state governance; from a micro point of view, the law is closely related to the people's food and food, food and food, and even family relations. Legalization of Chinese life world is of great significance to the comprehensive development of law. The second-day course is taught by teachers Zhou Chengxiong, Wang Jian and Li Wenshuang and so on. At first, several teachers share the development status of cultural industry, the development trend of scientific and technological innovation, the operation mode of cultural entrepreneurship and the specific cases of cultural investment, which show the development of cultural industry and related industries from many angles and many levels. Then, by simulating the form of business competition, the results of classroom teaching were tested, and the students gained a lot in thinking, discussing, displaying and asking questions. Gaining new insights through reviewing old material, promoting in the collision of views. In the first module, Professor Xue Zhaofeng looked at the legal phenomena from the perspective of economics, explained the provisions of the law, and shared the understanding of the antitrust legal system by economists; this module, Professor Deng Feng, from the law school, thought about the economics behind the law from the perspective of law. Professor Deng Feng carefully combed the academic history of law and economics, analyzed and evaluated the direction of the development of modern science, and clearly depicted the academic map of law and economics. With the development of economy, the issue of social justice is becoming more and more important. 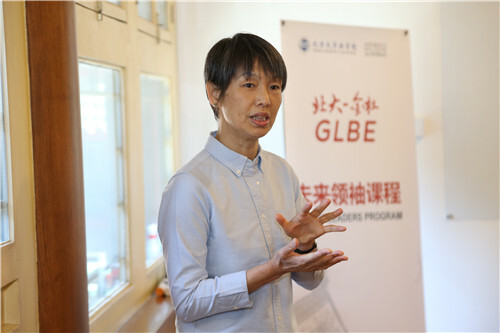 Third days' course, Professor Zhang Jing, director of Sociology Department of Peking University, taught the theory of social justice and its practical application in China. Through case studies, we discuss the formation and evolution mechanism of the concept of justice in China, and how to reconstruct a just system in China. The establishment of social justice to the evaluation of a better society is not only of theoretical significance, but also plays a decisive role in the political, economic and social governance of a country. After discussing the issue of social justice, it is a reflection on the mode of state governance. Professor Wang Xixin, vice president of the law school, analyzed the "method" and "road" of national governance: from the management mode to the mode of participation in governance, and focused on the elements, functions and Realization of the mode of participation in the governance. Public participation is a very important way in modern national governance. Orderly participatory governance enables the public to return from the role of the original public management to the role of the master of public governance. And the realization of participation in governance mode needs to be measured from two angles of macro democracy and micro democracy. Macro governance needs the party and the government to guide and grasp, but micro governance, orderly and effective public participation is a key and also an important practice of micro democracy. Only when social governance patterns turn to orderly participation can we bathe the warmth and sunshine of civic spirit. The lecture is not the end of the question research, but the starting point of our thinking. The three-day course will soon be over, but future leaders' thinking on culture and social governance will always be on the road.